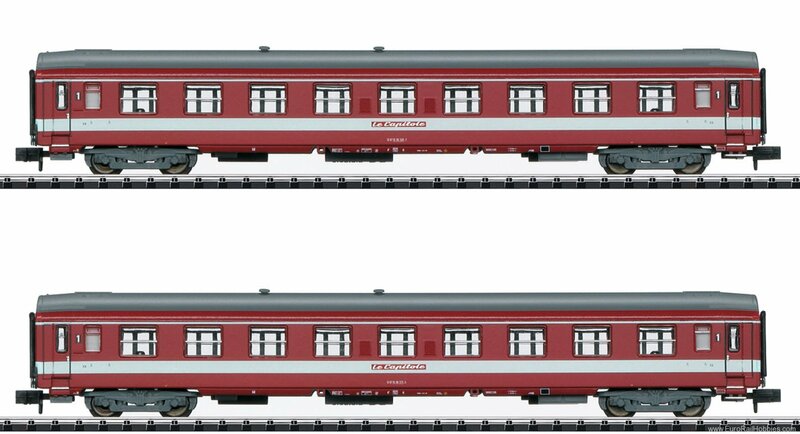 Prototype: 2 type A9 express train passenger cars, 1st class, painted and lettered for the French State Railways (Société nationale des chemins de fer français / SNCF). In the elegant, ruby red paint scheme of the "Le Capitole" express train. The cars have a close coupler mechanism. An interior lighting kit can be installed in the cars later. One car has the lettering "Le Capitole" on the sides and one car does not. Total length over the buffers 204 mm / 8".